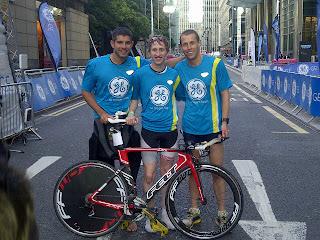 katieJsynge: Congratulations GE Canary Wharf Dream Team! Just a short and sweet blog to congratulate the GE Canary Wharf Dream Team. Canary Wharf is the third race of the GE British Superseries held in London. The Winning team consisted of two members of the Triathlon Shop. Chris Newman and John Wood, both whom race on the shops Felt Racing Team. John was representing the team in the 400m swim, then Chris took over for the 10km bike through the closed roads of London. They went on after the run to take team gold! The Triathlon Shop caters for all three disciplines from the novice to elite. Situated in Temple Quay, Bristol (just behind Temple Meads Train Station), the small but keen work team consists of keen triathletes from all abilities and backgrounds to help customers find exactly what they need. Follow them on twitter @TheTriShop, click here to be directed to their website, or click here to visit the facebook page, to keep up to date with stock, racing, competitions, advice, general info about the shop and team, or just to explore more and make contact.